Dangerous chemicals stored in a laboratory at the nuclear reprocessing plant have now been detonated by an army bomb disposal team. Explosives experts were called to the nuclear reprocessing site in Cumbria, to help deal with chemical substances. The 400ft tower at Windscale was on fire for three days, spreading radiation across the UK and Europe, causing over 200 cancer cases. The company in charge of developing a new nuclear power station in West Cumbria has admitted for the first time that the project will be delayed. NuGen chief executive Tom Samson said the consortium had hoped to have Moorside power station up and running next to the Sellafield nuclear site by 2025 but that this now wouldn't happen. He said that he expects to have secured a new investor by early 2018 and the start date to be the late 2020s. Hundreds of Sellafield contractors have returned to work following a walk-out last week. The 1,100 contractors were angered by the state of a changing room on the nuclear site. The Unite union now says that "it's confident" those issues can be resolved during talks this week. 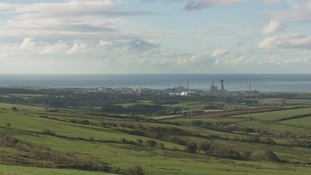 Sellafield says it's will work with the union to address their concerns.